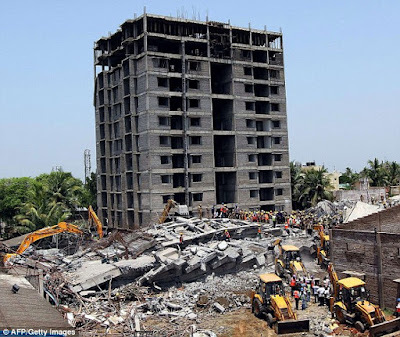 Home > Realty - DTCP Rules > Chennai Moulivakkam 12-storey Collapsed : Experts Say Govt. Must Pay Damages, Recover From Officials and Builder..! Chennai Moulivakkam 12-storey Collapsed : Experts Say Govt. Must Pay Damages, Recover From Officials and Builder..! With the Supreme Court sealing the fate of Moulivakkam's infamous twin buildings, `The Faith' and `The Belief ', people who purchased apartments in the two 12-storey structures will have to brace for a long legal battle if they hope to recover any of their investment or receive compensation. `The Faith' collapsed on June 28, 2014, killing 61 people, and the Supreme Court on May 12, 2016 ordered the demolition of `The Belief '. What is the way ahead for the flat owners? Citing a Bombay high court ruling in a similar case, former additional solicitor-general of India and senior advocate P Wilson said the government must first pay compensation to the flat owners and recover the amount from erring officials and builders. Conceding that initiating civil proceedings to recover the money would be a long-drawn and frustrating process for buyers, Wilson said the government must step in and cut short the agony of the apartment owners, most of who have invested savings of a lifetime -more so because its officials were guilty of negligence and oversight from the beginning. “Suppose the builder took a project loan from a bank, then every time a sale deed for a flat is executed, buyers must have taken consent or no objection certificates from the bank. If that had been done, to that extent the buyer's investment would be safe,“ civil case specialist Mr. S. Vasudevan said. The most effective way to realise the money in a relatively short period is to invoke the Securitisation and Reconstruction of Financial Assets and Enforcement of Security Interest Act, 2002 (Sarfaesi Act), says Vasudevan. Because the builder had mortgaged the property to several banks that financed it, individual flat buyers can sign private treaties with banks authorising them to take the Sarfaesi Act route. He said aggrieved parties in insolvency proceedings could challenge transfer of properties within a period of two years. “Banks and financial institutions are the real culprits, as they have surveyors and engineers to do due diligence, but failed to follow the rules,“ Vasudevan said.